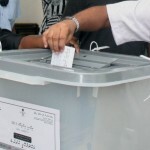 The opposition suspects schemes to deprive voting rights of Maldivians who need to re-register. Controversy surrounding voter registration for the September 23 presidential election deepened last week, as the opposition accused the ruling party and Elections Commission of scheming to disenfranchise voters. Thousands of voters who reside overseas, work in resorts or live in the capital with their permanent address elsewhere will have to register before August 11 to vote in their place of residence. On Thursday, the joint opposition lodged complaints with the human rights watchdog, raising concerns over fraudulent re-registration and the ruling party’s collection of re-registration forms from government workers. The five-member electoral body, chaired by a loyalist of the president, was accused of purposely refusing to process forms stamped by opposition parties. 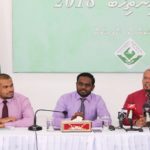 “They know for sure these are from people who will vote against President [Abdulla] Yameen,” Ali Niyaz, deputy chairman of the Maldivian Democratic Party, explained at a press briefing Wednesday night. The EC has refused to give confirmation slips for more than 2,000 applications, saying the forms have been sent to police for fingerprint verification, Niyaz said. “We’re getting information that police will reject a lot of these forms saying the fingerprints are wrong,” he added, noting that those voters would not be able to re-register after the deadline. But the opposition’s focal points have been able to re-register 17,054 people so far, he noted. 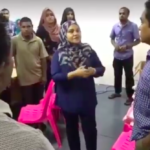 Niyaz said 90 percent of complaints to the opposition’s registration hotline (7776982) were from people who have yet to be re-registered after submitting forms through the ruling Progressive Party of Maldives. 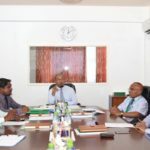 The MDP alleges that human resource heads are marking opposition supporters in the civil service and state-owned companies to withhold their forms. 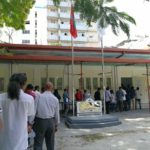 “When the forms are sent for entering and evaluating by the president’s own campaign, the employees are even more vulnerable to government intimidation,” the MDP said. The main opposition party referred to a video that emerged last week of the first lady saying that forms from the “civil service and companies” were being sent to the campaign office. “Employees were at no point informed their registration forms would be going to the PPM campaign offices,” MDP said. Adhlee Ismail, a PPM campaign manager, denied the allegations. “We take our time to check if the information on the forms is correct,” he told the Maldives Independent on Thursday. He declined to say how many forms have been collected so far. “This is a political campaign, so let’s leave that aside,” the CEO of the state-owned Maldives Industrial Fisheries Company said. EC president Ahmed Shareef meanwhile told local media that the number of forms submitted by the MDP was below 10,000. But Niyaz noted that most of the joint opposition’s forms would not be stamped. Aside from registration drives by parties, the EC has also set up booths in Malé and its suburbs to collect forms. About 27,000 forms were submitted as of Wednesday, according to the EC. More than 62,000 voters re-registered for the 2014 parliamentary elections. Some 263,181 people are eligible to vote this year. The EC’s decision to hand over forms to the police came after PPM MP Abdulla Khaleel accused the MDP of “committing huge fraud”. “1. They are filling forms under the names of several people and using fingerprints of three or four MDP members. 2. They are also destroying the forms of people they think will not vote for them,” the PPM secretary-general tweeted. EC member Ahmed Akram told the Maldives Independent that the commission is using three methods for verification. “Firstly we are verifying if all the information on the identity card matches the application. Then we are also sending the applications to police to verify fingerprints and then if there is any questionable information, we will also make calls to the applicant, to verify re-registration,” he explained. The EC will register voters whose ID number matches the information on their forms, he said. But voters could still find themselves de-registered after getting confirmation, which can be checked by sending a text to 1414 with VR (space) followed by the ID number. “We will be voiding any form that has a fake fingerprint. There is a difference between an unclear fingerprint and a fraud,” Akram said. Serious concerns about @ElectionsMv’s independence remain unresolved. EC requesting @PoliceMv to verify fingerprints on re-registration forms must be questioned when fears of EC working to disqualify opposition voters in the name of verification exist. This EC must be changed. 1. Fake re-registration forms being submitted. 2. Forced re-registration of civil servants & their forms being taken to PPM office. 3. Having to include resort seal on re-reg forms. Guys, better take re-registration thing seriously, my friend who is from dhangethi is somehow registered to G.Dh Nadella. > office claims to have sent registration forms last week Sunday, not registered as of 1 PM today. Mi kujjaa mee Addu Meedhoo ga abadhuves ulhey kujjeh! Meena miothy K. Hura ah register koffa!